On 5 September 2018, the Hudson Institute together with the Unrepresented Nations and Peoples Organization (UNPO) convened a conference in Washington, DC, on the impacts and challenges connected to the implementation of the China-Pakistan Economic Corridor (CPEC). Looking in particular at the political and human costs of the mammoth infrastructure project, panelists discussed the current situation of people in Gilgit-Baltistan, Balochistan and other minority-inhabited regions, while also looking on the longer-term effects CPEC might have on these areas. 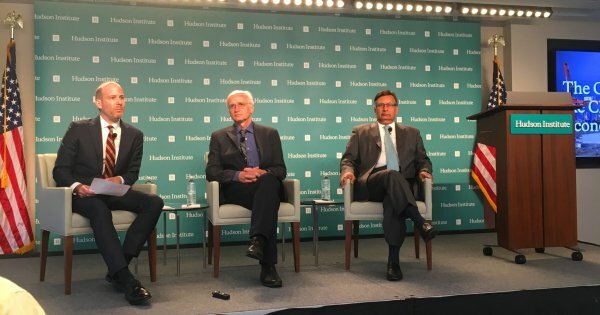 Hosted and moderated by Senior Fellow at the Hudson Institute, Eric Brown, the event saw presentations by Prof Dr Hermann Kreutzmann, Professor of Human Geography at Freie Universität Berlin, and Husain Haqqani, former Ambassador of Pakistan to the United States and currently Senior Fellow at Hudson Institute. Watch the recording of the panel discussion above or here. The conference was opened by Eric Brown (Senior Fellow, Hudson Institute) who drew attention to the importance of the issue raised by the conference and mentioned that - while CPEC had been hailed by both Islamabad and Beijing as a “strategic game changer and an economic boon” – the mammoth infrastructure project has generated growing criticism inside Pakistan itself for its lack of transparency and the limited inclusion of Pakistani workers and businesses. Prof Dr Hermann Kreutzmann (Freie Universität Berlin) elaborated on the circumstances around CPEC and the larger infrastructure and economic framework it is a part of, the Silk Road Initiative. While presenting the economic impacts and manifestations of the project, namely large infrastructure projects such as the Karakoram Highway and hydroelectric power plants, Prof Kreutzmann drew particular attention to the effects the project’s implementation has on the situation of minorities in Pakistan, including the people in Gilgit-Baltistan. A multi-ethnic region, home to numerous languages and religious sects, the people of Gilgit-Baltistan are being denied their right to get a share in decision-making concerning projects in their region. Prof Kreutzmann reminded the audience that the political disenfranchisement of the people of Gilgit-Baltistan dates back several decades and, to this day, contributes to rising tensions. He concluded his presentation by highlighting that, in order for CPEC to be the success the Pakistani government claims it to be, several circumstances of its implementation have to be adapted, including but not limited to increased community ownership, the involvement of local labour, proper political representation of the people of Gilgit-Baltistan, as well as guaranteeing sustainable economic development for the region as a whole. Ambassador Husain Haqqani (Senior Fellow, Hudson Institute) started his presentation by elaborating on the official Pakistani perspective on CPEC and its perception among the wider population. Mr Haqqani stressed that the Pakistani government deems any resistance to CPEC the result of foreign meddling. While the official discourse claims that the project’s costs would eventually be covered by the revenue generated by the economic corridor, once fully implemented, Ambassador Haqqani emphasized that the project is to a large extent the result of Pakistan’s disenfranchisement from the US and subsequent rapprochement with China, tied to the hope that CPEC could be an “economic life line” vis-à-vis closer US-India relations. Ambassador Haqqani then continued with discussing the points of critique brought forward by civil society in Pakistan, including the feeling that Islamabad, in the process of making agreements related to CPEC, has de facto granted China extra-territorial authority in parts of Pakistan (by virtue of bringing their own labour, having virtual control over all aspects of CPEC’s implementation). Another objection to the project’s implementation is that, while in the past Pakistan ended up creating dependence on the United States, this is now to a similar extent replaced by dependence on China. At the same time, Ambassador Haqqani added, CPEC’s implementation goes hand in hand with human rights violations and the crushing of legitimate struggles for autonomy in both Gilgit-Baltistan and Balochistan. This is compounded by the fear that China could export ideas, practices and methods it employs in its own minority-inhabited regions, such as draconic Sinification measures in the so-called Xinjiang Autonomous Region, to areas of Pakistan. Lastly, Ambassador Haqqani stressed economic concerns related to the implementation of CPEC, such as the fear of being irreversibly indebted to China with – due to the partnership being both economic and strategic – no way out in case the partnership should turn out to be lopsided. Following the panellists’ presentations, Hudson Institute’s Eric Brown opened up the discussion to questions from the audience. With questions both from other experts on the infrastructure project and Pakistani Americans hailing from Gilgit-Baltistan, the following discussion allowed for a fruitful exchange of views beyond the points raised during the panel discussion.